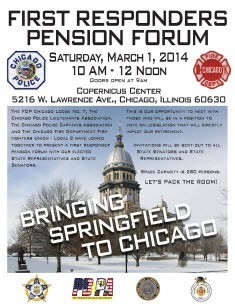 The Fraternal Order of Police Chicago Lodge 7 and the Chicago Police Lieutenants Association are conducting a Pension Forum with our elected State Representatives and State Senators all First Responders and City of Chicago Employees are welcome to attend. This is your chance to voice your pension concerns to the elected officials who are in the position to vote on legislation that directly impacts your retirement. Our elected officials will provide feedback on their positions and listen to your ideas and concerns. All State Senators and State Representatives will be invited to attend.